The Mt. 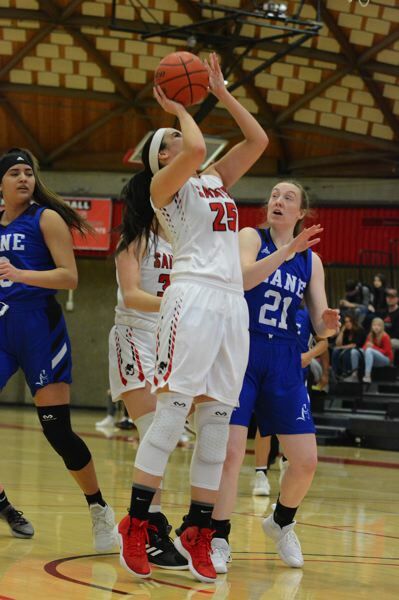 Hood Community College women's basketball team slipped a spot in the playoff chase after a 74-73 home loss to rival Clackamas in the Saints' regular-season finale Wednesday. Trailing by as many as 13 points in the fourth quarter, Mt. Hood closed to within a point on layups by Madison Allen and Rachel Watson in the final seconds. But the Cougars were able to run out the clock to pass up the Saints and move into third place in the South Region. Mt. Hood exploded for 24 first-quarter points, but sank only two buckets in the second quarter and spent the rest of the game chasing the Cougars. Mt. Hood center Rachel Watson led the team with 16 points, 10 rebounds and three blocked shots. Despite the loss, Mt. Hood (20-9) has clinched a playoff spot and will discover their first-round opponent during the Northwest Athletic Conference Selection Show at 6:30 p.m. Sunday. The Mt. 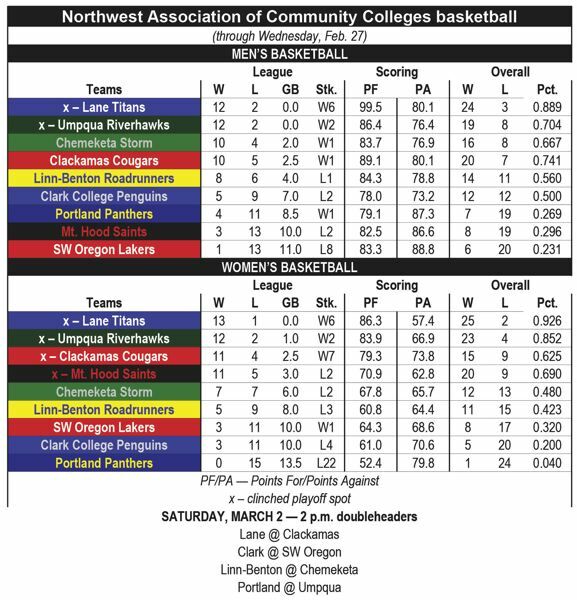 Hood men's team dropped a 96-86 decision to a Clackamas squad that needed a win to stay in the playoff hunt. After getting within a point three different times, the Saints finally pulled into the lead 80-77 with 5:54 left on a pair of Carter Arrasmith 3-pointers. Mt. Hood maintained a slim lead for several minutes before Clay Sullivan knocked down a 3 to give Clackamas a lead it would not surrender. Robert Ford sank a couple deep balls on his way to a game-high 27 points to secure the victory. The Cougars hit all four of their free throws in the final minute. The Saints' Devin McShane and Arrasmith combined to go 10-for-18 (.555) from behind the arc. The game marked the last for Saints' head coach John Hawley, who is retiring, while assistant Nate Bowie takes the helm heading into the off-season.